News of progress on forthcoming books and events. The text is being typeset. The paper has been ordered. The illustrations are in hand. As we both achieved Bus Pass age this year, Angela and I celebrated by taking Palladio's Villa Saraceno for a week. 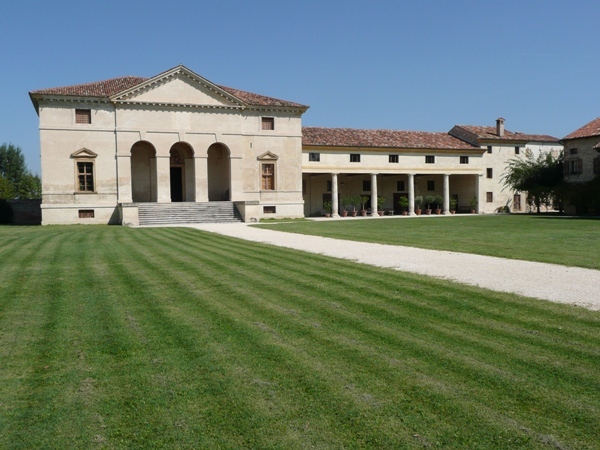 Built around 1550 just south of Vicenza, the villa latterly fell into disrepair but it was acquired in the 1990s by the Landmark Trust who did a fantastic job of renovating it, along with its adjoining barchessa and casa vecchia, to give accommodation for 16 people. In the event we had six very old (i.e. long-standing!) friends and three family members join us for the week. Fantastic. Villa Saraceno is one of the villas that I have included in Palladio's Homes and, indeed, one of the seven that Signor Carlo Rapp is illustrating for the book, so it was an extra pleasure for us to welcome him as an overnight guest during the week. The copy has gone to Stan Lane at Gloucester Typesetting and he is in the process of keying and casting it in the Monotype typeface Dante which was designed by Giovanni Mardersteig based on 15th-century Italian models. (Born in Weimar, Mardersteig moved finally to Italy where he operated his private press, Officina Bodoni, whose books exhibit consummate press-work yet, for my money, are just too dry.) His original design was hand-cut by the great punch-cutter Charles Malin, and it was then adapted for mechanical composition by Monotype in 1957. It feels somewhat heretical to go against the design choice made by the Monotype Drawing Office; but thanks to its relatively low use of letters with descenders, Latin always has a lovely regular look on the printed page, a property that Italian to a degree retains, more so than English anyway with its relatively plentiful y's and g's in particular. So I was hoping to achieve that same solid effect that makes 15th- and 16th-century pages from the Venetian presses looks so fine, with tightly set and justified long lines. Just that small change in the set made what I felt was an important improvement and in particular it improved the tightness of the words on the lines, adding to the overall look. So that is how it will be. I'm still not sure about the leading - the earliest printers rarely leaded their lines - I guess Aldus for example was aiming to get as much on those small pages as he could, just like any paperback publisher today - so I am torn between the same effect and my normal desire to be able to have the individual line look individual, without having it all fall part. Stan has cast about two-thirds of the text - twenty large galleys - which I collected this week, so some experiments are in order. Given that the text is finalised and the overall layout decided, I've finally been able to calculate the paper required. So I gritted my teeth the other day and sent an order for 3,500 sheets of hand-made paper from Cartiera Amatruda in Amalfi, Italy. Gulp. With type and paper in hand soon, I shall start work on finalising the page layout ... and clearing the press-shop ready for action. Firstly, this meant tidying up my galley racks which over time fill with type awaiting dissing, type for things I might just need again (a prospectus for instance), and type that can finally be sent back. Secondly, I had to see if I had sufficient leads. My normal long line is 32em so I have considerable quantities of 32em leading; but this book is mostly on a 34em measure (about a third being on 24em), so I have had to check just how much leading I have of that length in 2pt, 3pt, and 6pt. I found a decent amount in my lead racks, as well as a quantity of 35em (where did that come from?) which I'm unlikely ever to use so was cut down to 34em and added to my stock. Once I have experimented and decided whether the leading is to be 3pt or 4pt I can decide what my shortfall is and to ask Stan to cast for me. For details of the event, including times, visit the St Bride website page. The exhibitors include The Old School Press, Experimental Letterpress Workshop, Hi Artz Press, Incline Press, I M Imprimit, New North Press, and Strawberry Press. Over a five year period, Martyn Thomas and I had several long conversations with one-time Printer to Oxford University, Vivian Ridler. His post put him in charge of the Printing House at Oxford University Press between 1958 and 1978. For ten years before that he was Assistant Printer to Charles Batey. We were interested in particular in his memories of working with Stanley Morison and Harry Carter, as part of our researches for some of the books we have published about its recent history. We recorded the conversations really for our own benefit so that we could go back to what was said later on and not have to take copious notes there and then. But they are delightful records and we have now made them available for all to hear on our website. They are far from being formal oral history interviews, just conversations - don't be surprised if you hear Anne Ridler bringing in a tray of tea and biscuits. They were recorded at his home in Oxford in 1999, 2000, and 2003 during our research for The Fell Revival and Stanley Morison & 'John Fell', but we strayed into much of the surrounding territory including Ridler's own career. To listen to them, go to our website and click on the 'voices' button on the left. You will find three groups of recordings, one for each year. We have acquired copies of four of our out-of-print titles and can offer them for sale. Postage and packing are charged at cost. If you would like to buy one or more, please reply to this email telling us which you would like. You can read details about and see photographs of Punting to Islip, The Fruits of Jane Austen and Henry James Sat Here here. Henry James Sat Here. I have a signed copy that was surplus to the edition and hence is not numbered; it is otherwise exactly as the editioned copies which were �150 each - this one is just �95 and it is in fine condition. And I have a further unsigned, unnumbered copy that has a fresh copy of the zigzag but in a box that was used for the display copy and which is therefore a little 'tired' - �75. Punting to Islip (standard edition). I have two fine copies - �45 each. The Fruits of Jane Austen. I have one fine copy - �95. On Durham (case-bound in handmade kozo paper of which there were 50 copies) is �20. I have one fine copy.